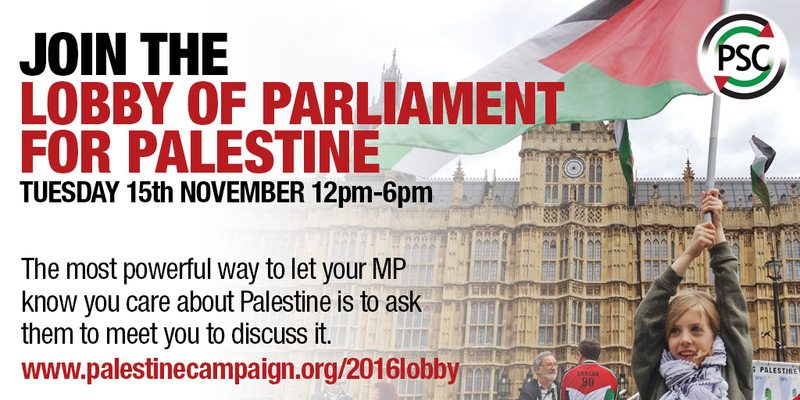 Join us on Tuesday the 15th of November from 12pm-6pm for our National Lobby of Parliament for Palestine. The most powerful way to let your MP know you care about Palestine is to ask them to meet you to discuss it. On Tuesday the 15th of November, people from around the UK will arrange to meet their MPs in Parliament on the same day to ask them to take action against Israel illegal settlements. By doing this together, it shows MPs that there are a huge number of people all across the country who care about Palestine. Please click here to read the briefing about the lobby. It includes all the practical information you should need, as well as a key points about Israeli settlements, which we would like you to discuss with your MP. Printed copies will be available on the day. We need you to join the lobby. The UK Government calls Israeli settlements illegal and a barrier to peace. And yet in spite of their words, they have taken no action. We are campaigning, with partners in Palestine and the UK, to demand the UK government takes decisive and effective action against Israel in order to stop the continual building of illegal settlements. No! You do not need to be an expert, we will provide you with all the information you need in advance and will have experts on hand on the day itself for last-minute preparation and questions. Your MP will be used to meeting local people who care passionately about an issue, but they shouldn’t expect you to know everything. Coming to the lobby is one of the best ways to show solidarity with the Palestinian people and we are sure you will get a lot out of the day. You’ll meet lots of like-minded people, our preparation talks are interesting and informative. It is also a great way to visit Parliament, and there is also an evening rally with MPs, Lords and other great speakers. If you can’t be at the Lobby of Parliament that day, but still want to support the event, please click here to send your MP a letter asking them to support the Lobby, even if you cannot attend. Check this page for details and updates about the lobby or contact annabel.howarth@palestinecampaign.org if you have any questions.